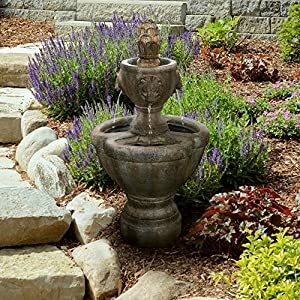 UNIQUE OUTDOOR DÉCOR- This two tiered water fountain is truly an ideal blend of antique vintage design, classic elements, and royal charm, and it offers the tranquil and meditative sounds of running waters for a calming ambiance. With the water gently cascading down from the lion’s head into the bottom tier, the outdoor fountain is sure to be a vivid focal point on your patio, deck, front door, outdoor entranceway, lawn, or garden! DURABLE DESIGN- Enjoy your outdoor, lawn, garden, or yard décor without worry. Made from sturdy polyresin material, this fountain is lightweight and weatherproof for longer lasting outdoor use. LOW MANITENANCE AND EASY SET UP- Pure Garden water fountains require no additional plumbing, stressful setup, or upkeep. Including a UL listed pump with 93 gph maximum flow, all you need to do after assembly is fill it with the proper amount of water, and plug it in to a standard electrical outlet, and you are ready to enjoy the delightful sounds of nature. 326 queries in 0.766 seconds.